Warning labels are not working to prevent children from ingesting Buckyballs and other powerful magnetic toys, a group of digestive health doctors said Tuesday. The magnets can pierce holes in the intestines, and some children have needed multiple surgeries and lengthy hospitalizations. Since 2010, there have been warning labels on Buckyballs - on five places in each box, and in accompanying instructions - aimed at keeping the magnets away from children. But the warning labels on the high-powered magnetic toys are ineffective, the North American Society for Pediatric Gastroenterology, Hepatology and Nutrition said Tuesday. The group released the results of a new survey of more than 1,700 doctors, who reported at least 480 toy magnet ingestions in the past decade, with 204 occurring in the past year. Gilger said young children sometimes think the toys are candy, and older children and teens sometimes use the toys to mimic jewelry like tongue or cheek piercings. In July, the Consumer Product Safety Commission sued the maker of Buckyballs to get the company to stop selling its products, but the company refused, according Scott Wolfson, a spokesman for the federal agency. 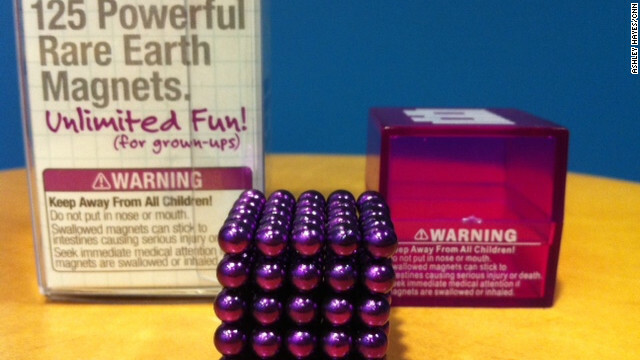 A spokesman for Maxfield and Oberton, the maker of Buckyballs, on Tuesday defended the company’s efforts to keep powerful magnets away from children, including the use of warning labels. In a statement, Maxfield and Oberton said that in addition to using warning labels, the company does not advertise or sell its products to children and has a strict policy of not selling to stores that do sell toys exclusively to kids. Once again try to ban a simple product because parents are too stupid. Do anyone of you know that in other countries they laugh at us about this stuff? I've seen it in England, Spain, France, Italy, Germany, and Denmark. They think we are stupid. Should have heard them over the stroller closing issue a few years ago. It's not a matter of banning products it's a matter of paying attention to your kids. WARNING: Do Not let your kids play with gasoline and matches. Also, you should not allow children to play with loaded guns, play with fire and gas, water and electricity, drugs, drinking and driving. Everyone wants everyone else to be responsible for their actions!! When did we become this gelatinous, spineless society that we are now?! When lawyers decided that they could make waaaaaaay to much money suing and when said lawyers could convince idiots that free money came from blaming others for the idiots' mistakes. I agree with Shane, let's ban cars, gasoline, kitchen knives, and other safety issues. OR, shut the F up about this, and make parents DO their JOB in watching and raising their kids. I say take ALL the warning labels off everything and watch natural selection in action. How about parenting? Anyone try that yet????? The danger in swallowing magnets is non obvious and non intuitive. Out of the pack, the colored balls particularly look just like a form of modern candy. And very young crawling children instinctively test new discoveries by tasting them in their mouths. Then keep them away from your children. It's that simple. Adults with children have no business bringing these items into their home. If you purchase them, then fail to read, and heed the warning on the label, then shame on you if your child is injured. That parent shares in the blame imo. If you have no children, but on occasion babysit, or have children over, then you need to make sure such items are put away. Older children or teens that stick them in their mouths should know better. You cant eliminate all potential dangers, so parents have to be vigilant. I have a 19 yo, 14 yo and an 8 year old. If it looked like it could be swallowed, or choked on, it was kept out of my house, or kept out of reach. How about not bringing them into homes with little kids then? No one is forcing you to buy them. Any parent stupid enough to buy these and leave them where a child can ingest them should be charged with reckless endangerment and serve some time. Make an example of a few of them and that will get the message across. And, I agree that banning them is a silly thing to do. Now, where can I get a bunch of them? You can't say you're for safety if you sell your products for 50-60% off like a fire sale. That isn't advocating safety. Neither is bashing the CPSC in cartoons and on tv. I don't agree with banning, but I wouldn't try to take down an agency who's duty is to protect children. How does discounting a product mean you are anti-safety? They tell you "NOT FOR KIDS". Parents need to take personal responsibility. Hi my friend! I want to say that this article is amazing, nice written and come with almost all vital infos. I would like to look more posts like this . Magnetic labels are what you need in your growing business. Visit our page http://www.ablt.com/.